In the second class of the beginner’s series we explore standing and standing postures. In these postures our feet are connected to the ground and our body is in an upright position. This is the active position we go out into and interact with the world. In this class we will explore what it is like to inhabit our bodies from this position. What is happening in our bodies? What stands out about our physical experience? What emotions are present? What thoughts move through our minds? What is it like to connect with our spirit from this position? We will also move our spines in all directions from flexion (forward bending), to extension (back bending) laterally (side bending) and rotation-ally (twisting). Standing offers a very different experience to gravity from the first beginners class in the series (the preparatory poses). This entire class will be experienced from the standing position. We love your feedback, thank you for leaving your comments, liking our videos on YouTube, leaving your rating on iTunes. of unlimited classes (which is actually only 49 classes in a week, and only between the hours of 7:30 am and 7:30 pm). So if you have been receiving value from doing Namaste Yoga for one class, one week, one month, 3 months, 6 months, a year or more, consider offering a donation to express your appreciation myself and Tim. There are many ways to give back, you can give a monetary donation or you can give of your time by subscribing to our channel, leaving your comments, or sharing the class with somebody else you believe would receive value. 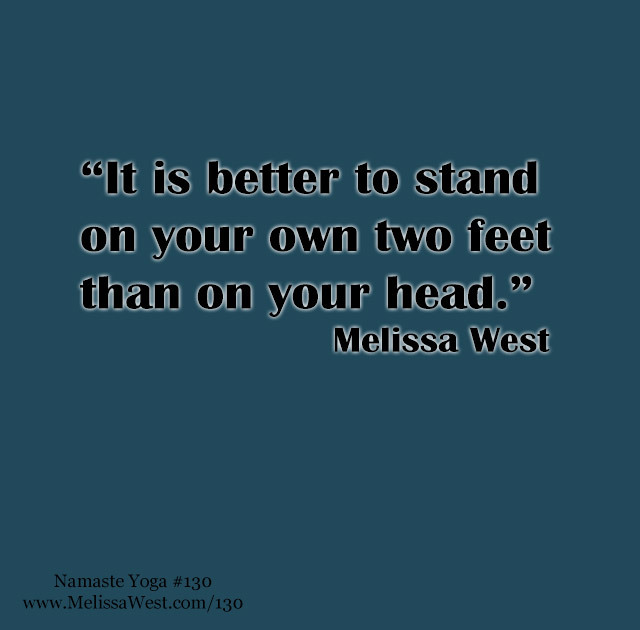 Today’s question to answer in the comments is: How does yoga help you to stand on your own two feet?